Take the motorway A81 to the Zuffenhausen exit, and from there the B10 toward Stuttgart. Stay on the B10, which turns into the Heilbronner Straße and then Pragstraße, until you reach the Wilhelma Zoo. Leave the B10 there and drive straight ahead and across the Neckar River on the Rosenstein Bridge, then take Schöne Straße and Mercedesstraße toward Gottlieb Daimler Stadium past the Schleyer Halle. Finally, turn right onto Talstraße and drive until you reach the parking areas P9 or P10. Take the motorway A8 until you reach the Leonberg junction, then drive either via the A81 toward Heilbronn until you reach the Zuffenhausen exit and continue as described when coming from Heilbronn, or drive via the A8/81 toward Munich until you reach the Stuttgart junction, then take the A 831 and continue as described when coming from Singen. Take the motorway A81 until you reach the Stuttgart junction, then change to the A831 toward Stuttgart until the motorway ends and continue on the B14. There is a Park and Ride station here, or you can follow the B14 through the entire downtown area up to the König Karls Bridge across the Neckar River. Then turn right towards Schwäbisch Hall onto Mercedesstraße past the Schleyer Halle, then turn right again onto Talstraße until you reach the parking areas P9 or P10. Take the B27 via Degerloch (there is a Park and Ride station here) up to downtown Stuttgart, then turn right onto the B14 toward Fellbach-Waiblingen up to the König Karls Bridge across the Neckar River. Turn right here onto Mercedesstraße toward Schwäbisch Hall past the Schleyer Halle and turn right again onto Talstraße until you reach the parking areas P9 or P10. Take the motorway A8 up to the Wendlingen exit, then get onto the B10 toward Esslingen and continue toward Stuttgart up to the Gottlieb Daimler Stadion exit. From there take Talstraße and the Gaisburger Bridge across the Neckar River up to the parking areas P9 and P10 in front of the Schleyer Halle. Take the B29 up to Waiblingen, then continue on the B14 toward Fellbach and Stuttgart up to the Benzstraße exit. 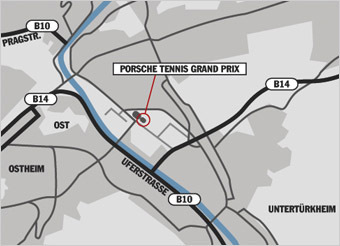 There turn left onto Benzstraße and drive past the Schleyer Halle and straight ahead through the tunnel to parking area P10, or turn left after the Schleyer Halle onto Mercedesstraße, then turn right onto Talstraße and the access to the parking areas P9 and P10.